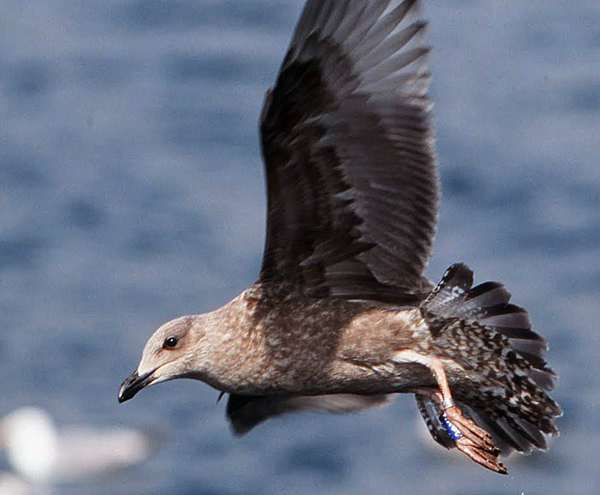 The issue of Dutch Birding 26: 1-35, 2004 contained a very comprehensive paper on the identification of smithsonianus, titled: Identification of American Herring Gull in a western European context. It was written by Pat Lonergan & Killian Mullarney. The outstanding text is copied on this webpage, with links now added to various Canadian birds photographed throughout the months. When appropriate, more details from recent field research has been added as well. Full PDF download: HERE. "we" in the text below refers to the original authors. If any errors occur in this text, please let me know and mail to marsmuusseatgmaildotcom. 1 American Herring Gull Larus smithsonianus, juvenile, August 25 2010, St. John's, Newfoundland, Canada (Dave Brown). Individuals as dark as this one should not pose any identification problems in Europe. Generally speaking, moult in smithsonianus is similar to that of argentatus and argenteus as outlined by Grant (1986) but with important clarifications described by Howell et al (1999). 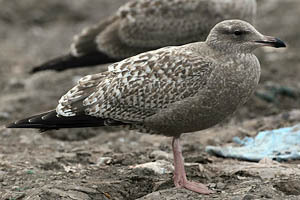 The tendency for some first-years smithsonianus, apparently originating in northern latitudes, to postpone their post-juvenile moult until mid-winter, or even spring of their second calendar-year, mirrors a similar strategy employed by a significant number of argentatus (Nikander l996, Howell 200l, pers obs) but overall, moult is of little or no significance when it comes to identifying individual herring gulls. Smithsonianus averages a large heavily built bird, appearing similar in size and proportions to argentatus, thus larger than an average argenteus. Many immatures have a demeanour which recalls first- and second-year Glaucous Gull due, perhaps, to the combination of a rather thick, long, bicoloured bill and a tendency to have rather uniformly coloured underparts. Bill structure averages slightly different too, since many smithsonianus have parallel-sided bills with little gonydeal angle. The bill also averages slightly longer than in European Herring Gulls - but there is overlap. 2 American Herring Gull Larus smithsonianus, juvenile, August 25 2010, St. John's, Newfoundland, Canada (Dave Brown). Note pale window on inner primaries, dark base to greater coverts, densely barred rump and undertail and very limited vermiculation along edges of outermost rectrices. 3 American Herring Gull Larus smithsonianus, juvenile, September 22 2012, Plum Island, Massachusetts, USA (Suzanne Sullivan). 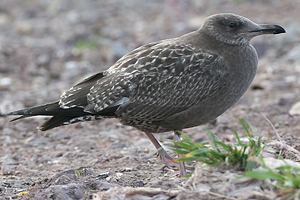 Note heavily barred rump and uppertail-coverts, barely contrasting with back; also, note almost entirely dark rectrices with contrastingly pale shaft and narrow 'barred' strip along outermost edge. 4 American Herring Gull Larus smithsonianus, juvenile, October 08 2006, St. John's, Newfoundland, Canada (Bruce Mactavish). Note uniformly dark underparts. 5 American Herring Gull Larus smithsonianus, juvenile, November 03 2012, Lake Balmorhea, Texas (Tripp Davenport). 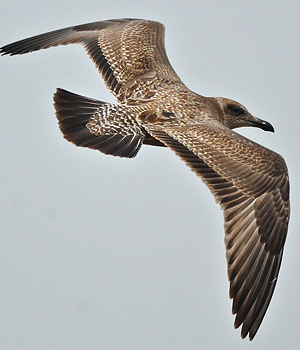 Shape and structure of this bird and, especially, weak bill recall Lesser Black-backed Gull L fuscus graellsii. Note, however, suggestion of densely marked ventral area. 6 American Herring Gull Larus smithsonianus, juvenile, October 08 2006, St. John's, Newfoundland, Canada (Bruce Mactavish). Note uniformly dark lower hindneck and underparts. 7 American Herring Gull Larus smithsonianus, juvenile, October 08 2006, St. John's, Newfoundland, Canada (Bruce Mactavish). Wear on scapulars, tertials and wing-coverts has reduced pale edges to these feathers. Note densely patterned vent and undertail-coverts and apparently all-dark tail. Several juvenile scapulars and mantle-feathers have been replaced with first-winter feathers. The following accounts treat each age category, juvenile, first-winter, second-winter and so on up to adult, individually and in that order. Obviously, there is overlap in juvenile and first-winter plumages, and a certain amount of duplication in their respective accounts is unavoidable. We restrict ourselves to describing the appearance of smithsonianus in the winter period since practically all of our first-hand experience, both in North America and in Europe has been between September and April. Due to the effects of fading, wear and active moult, the summer months are considered a much less rewarding time to study gulls and it may be that this is a significant factor in explaining the virtual absence of summer records of smithsonianus in Europe. However, observations of at least two birds that over-summered in Cork in 2001 (Birding World 14: 224, 2001) suggest that detection of birds in first-summer plumage may not be as difficult as might have been imagined. 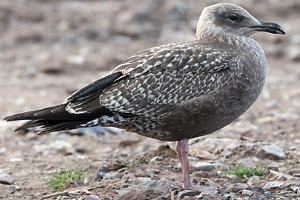 The extent of age-related, seasonal, sexual and individual variation in large gulls is well known and accounts for many of the associated ageing and identification problems. 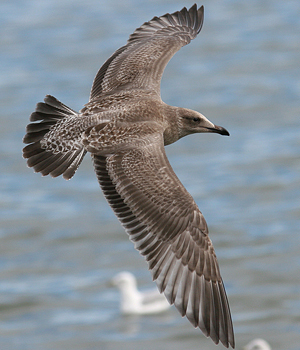 The potential for individual variation that exists in most large-gull taxa and the consequent overlap in the appearance of many characters has an important bearing on the identification of all ’out-of-range' or vagrant large gulls, and this is particularly true when considering claims of smithsonianus in Europe. While it would be unreasonable to expect every smithsonianus recorded in Europe to correspond exactly with the most ’classic’ examples portrayed in this paper the great majority should, we suggest, be of typical appearance. Although every case should of course be considered on its merits, problematic birds (ie, birds with a mix of ’good’ and ’bad’ characters) are arguably more likely to be unusual-looking European Herring Gulls than aberrant or atypical smithsonianus. There will always be cases of contentious birds where it is difficult or impossible to prove that they are not smithsonianus, even though birds matching their appearance would be considered unusual, or even exceptional, in North America. At the risk of losing a few records of ’good' birds, we are inclined to recommend that, for the time being, only those birds with the strongest credentials be considered ’acceptable’ in Europe. It is impossible in a paper such as this to cover the vast extent of variation in these gulls. All we can do is try to define what we consider the most useful identification characters for each age group and anticipate the most likely sources of confusion. We cannot emphasize enough the importance of acquiring a comprehensive familiarity with the commoner species of large gull and of always keeping in mind the potential for variation in these birds. The greatly improved understanding of gull identification over the past 20-30 years has developed hand-in-hand with a wider appreciation of the effects of fading, wear and moult on the appearance of gulls. 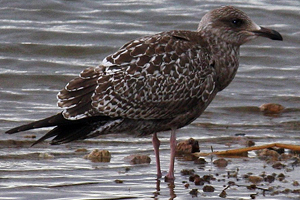 The systematic and analytical approach to gull identification, pioneered most notably by the late Peter Grant, places great reliance on critical examination of photographic material in resolving and defining the sort of detail that we now employ routinely in the field when attempting to identify more difficult individuals. At this level, we believe that a combination of photographs with dedicated captions offers the most effective means of conveying the kind of information most relevant to identification, hence the emphasis on photographs in this paper. September 27 2009. A rather smithsonianus-like individual with heavily barred rump and undertail-coverts, dark tail, rather plain dark breast/belly etc. 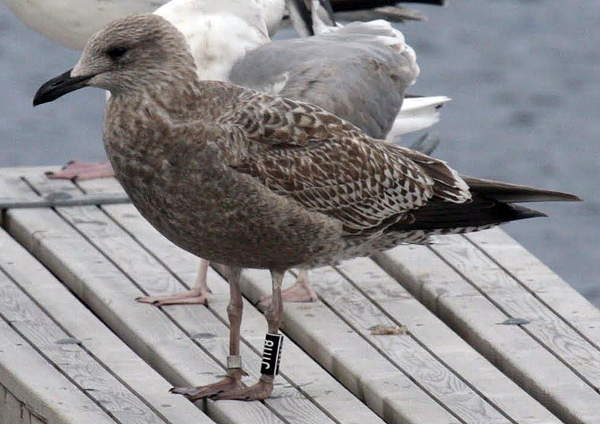 The main problem is that it is wearing a ring; black J1118 was ringed as chick in a colony of argentatus Herring Gull at Storøytåa, Mandal, Norway on 25.06.2009. The ring also poses a problem, of course. This bird was ringed as a chick on Storøytåa, Mandal, (southernmost) Norway 23.06.2006 in a colony of argentatus Herring Gull. The prescence of birds looking like this, evidently born in a Norwegian population, makes positive identification of smithsonianus in Europe very difficult. 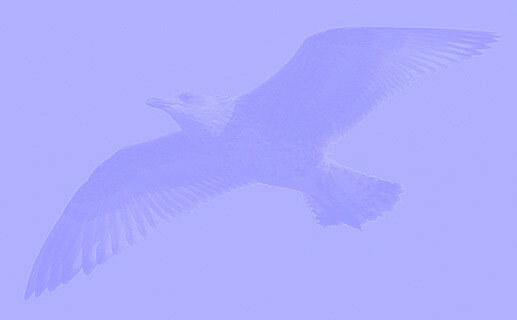 It is of course a possibility that smithsonianus has interbred with argentatus for years in the Storøytåa colony. This could explain the regular occurence of smithsonianus-lookalikes in the area. Hybrid smithsonianus x graellsii F07 1st & 3rd cycle, July - August 2011 & May 2014, Appledore Island, NH. American Herring Gull (smithsonianus) J01 1st cycle, August 14 2014 & May 22 2015, Appledore Island & Delaware Bay. Picture: Lauren Kras & Emily Weiser. American Herring Gull (smithsonianus) R09 1st cycle (1CY), August 17 2012, Plum Island, MA. Picture: Suzanne Sullivan. American Herring Gull (smithsonianus) juvenile X47 August 06 2012, Hampton Beach, NH. Picture: Jon Worthen. American Herring Gull (smithsonianus) juvenile X50 August 30 2012, Jodrey's Pier - Gloucester, Massachusetts. Picture: Keith Mueller. American Herring Gull (smithsonianus) juvenile Z23 August - September 2013, Jenness Beach & Hampton Beach, NH. Picture: Jon Worthen & Lauren Kras. American Herring Gull (smithsonianus) juvenile Z65 August 24 2013, Jenness Beach, Rye, NH. Picture: Lauren Kras. 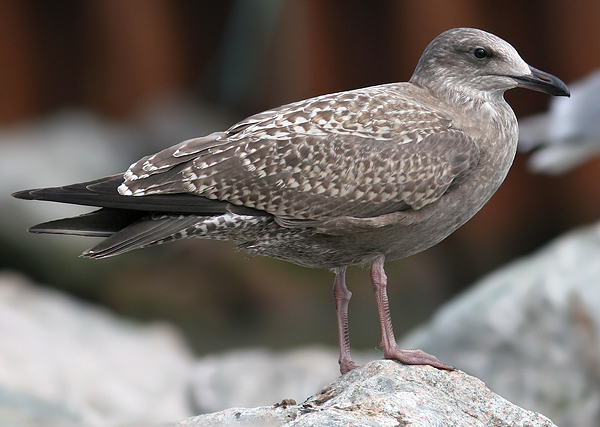 American Herring Gull (smithsonianus) 06F 1st cycle (1CY), August 26 2015, Hampton, NH. Picture: Robbie & Colleen Prieto. American Herring Gull (smithsonianus) 1cy, August 25 2010, St. John's, Newfoundland, Canada. Picture: Dave Brown. American Herring Gull (smithsonianus) juvenile, July 14 2013, Sheboygan, Lake Michigan. Picture: Amar Ayyash. American Herring Gull (smithsonianus) juvenile, August 10 2012, Lake County, IL. Picture: Amar Ayyash. American Herring Gull (smithsonianus) 1cy, August 17 2014, 5-12 miles offshore from Berrien County, MI. Picture: Amar Ayyash. American Herring Gull (smithsonianus) 1cy, August 24 2013, Portland, Maine, USA. Picture: Bill Bunn.